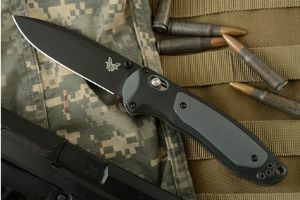 Description: The Benchmade Boost (590BK) offers a reliable fast opening action and Dual Durometer handles to greatly increase grip performance during heavy use. The drop point blade is made from CPM-S30V stainless steel. CPM-S30V is an American-made and developed premium grade stainless steel created especially for knives. It is a powdered metallurgical steel with a uniform carbide distribution and clean steel properties. This gives the blade superior corrosion resistance, toughness, and edge retention. 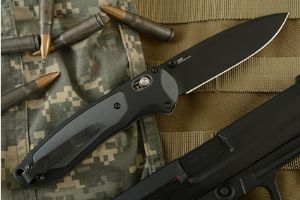 Dual thumbstuds and the patented AXIS-Assist lock make ambidextrous one-handed opening a breeze. Once initial pressure is put on the thumb stud, the AXIS-Assist mechanism effortlessly takes over. A spring assists the user with ultra-quick opening action. Dual durometer handles feature dark grey grivory wrapped in molded Versaflex for added strength and grip performance. The back of the liners and Grivory backspacer have been jimped to aid in pulling the knife from the pocket. 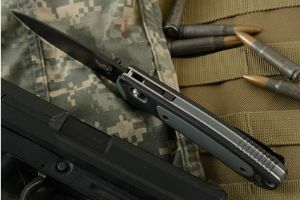 The knife can be locked in both the open and closed positions. 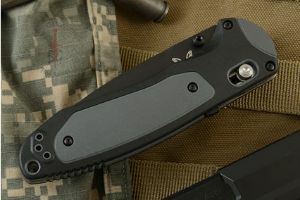 Includes a reversible deep carry pocket clip mounted for tip-up carry.